Always on my list of To Dos or rather, To Sees, Sweeney Todd has been one of those elusive works that I never seemed to be able to catch anywhere. I’ve always wanted to see the film version as well, which stars Johnny Depp as the titular character, but haven’t gotten around to that either. Therefore, when I learned that UCONN’s Connecticut Repertory Theatre (CRT) was mounting Sweeney Todd: The Demon Barber of Fleet Street, A Musical Thriller in Concert during its 2018 Nutmeg Summer Series, I was tickled pink – or red (blood red), as the case may be. What’s more, with all the theatre we see as reviewers for Pillow Talking, my husband and I are so very fortunate to often be in the presence of countless greats who grace the many stages. But for my first ever production of Sweeney Todd, how utterly phenomenal was to experience it with the inimitable Terrence Mann? The iconic actor who originated such Broadway roles as Rum Tum Tugger in Cats; the Beast in Beauty and the Beast; and Javert in Les Miserables, among many others is now my gold standard for the demon barber. What an absolute privilege! Not only did Mann not disappoint, nor did any of his costars. They include Equity actors Liz Larsen as Nellie Lovett, Ed Dixon as Judge Turpin, and Andréa Burns as the Beggar Woman, as well as the phenomenal students (CRT casts up-and-comings who invariably rival the talents of the professionals they act alongside) which include Hugh Entrekin as Anthony Hope, Emilie Kouatchou as Johanna Barker, Kenneth Galm as Tobias Ragg, Lu DeJesus as Beadle, and Nicholas Gonzalez as Pirelli/Daniel O’Higgins. Not to be left out is the talented chorus: Ryan Albinus, Alex Campbell, Cydney Clark, Olivia Fenton, Lauryn Hobbs, Kelly McCarty, Charlie Patterson, Gregory Rodriguez, Brandon Wolfe, and Alessandro Viviano. For those who may not be familiar, Sweeney Todd: The Demon Barber of Fleet Street has a lengthy and exceptional history that dates back long before its Broadway opening in 1979. With music and lyrics by Stephen Sondheim, book by Hugh Wheeler, and orchestrations by Jonathan Tunic, the musical version is based upon the 1973 play by Christopher Bond. Additionally, the tale of the demon barber has origins which have elements in early nineteenth century Victorian fiction known as “penny dreadfuls.” At the crux, Sweeney Todd, a pseudonym for the framed and wrongfully imprisoned Benjamin Barker, is a psychopathic barber who wields a fine silver straight razor in seeking revenge on mankind. At the outset, a bedraggled Todd is rescued by a young sailor named Anthony Hope. He has finally returned home following banishment by the crooked Judge Turpin. He enters the company of a very colorful but failing Fleet Street meat pie shop owner by the name of Mrs. Lovett. Before long, Todd learns from Lovett that in his absence, his wife, who had been raped by Turpin 15 years prior, drank poison, and his infant daughter, Johanna, had become Turpin’s charge. Incensed, Todd won’t rest until Turpin and Beadle, the man with whom Turpin colluded, pay for their crimes. Todd sets up shop in his old stomping grounds – above Lovett’s bakery. His thirst for vengeance turns bloody, however, when he slits the throat of his first victim – an outrageous, charlatan Italian barber named Adolfo Pirelli who reveals he knows and plans to expose Todd’s true identity. Leaving behind Pirelli’s apprentice, the ragamuffin Tobias Ragg, proves problematic for Todd. The situation grows more sinister when Lovett reasons that human flesh may reinvigorate her business; transforming her drab and tasteless meat pies into gastronomic delights. Lovett and Todd’s endeavor as butcher and baker is successful and they develop a thriving partnership. 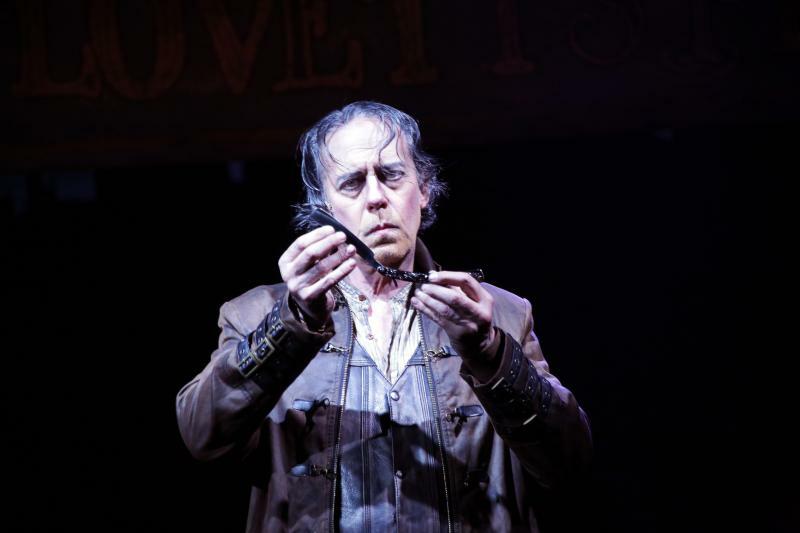 When casting is spot-on and a story is enthralling, an audience can all but lose itself in the experience, even in one as dark and heinous as Sweeney Todd. 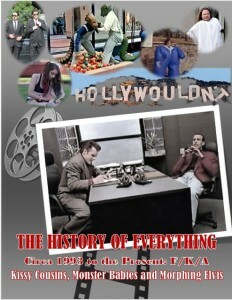 Expertly directed by Peter Flynn, he brings out the best in everyone with brilliant staging. Mann as Todd completely enraptures – he’s the perfect blend of diabolical yet tormented; masterful yet mad; but at the same time vulnerable and sad. And as I said earlier, it is a consummate treat to see this triple-threat (or is it quadruple? quintuple?) in action. Larsen as Lovett is like a darkly twisted Energizer bunny, who teeters on the edge of sanity and is amoral to the core, but somehow affable at the same time – and she’ll have you completely in stitches. I had the wonderful opportunity to chat with Ms. Larsen after the production and just had to tell her she was born to play the role and I was shocked to learn it was her first time. Dixon as Turpin is as exceptional in his delivery as he is hateful as this lecherous and utterly disgusting reprobate – the man you’re thrilled to see get his just desserts. Burns as the Beggar Woman is hysterical as the lewd and foul-mouthed, deranged tramp. Entrekin is wonderful as the charming Anthony who falls head over heels for the captive young Johanna, who is played by the enchanting songbird Emilie Kouatchou. Galm as Tobias is a riot as the simpleton who knows too much. Lu DeJesus as Beadle is terrific as the perfectly pompous schemer and right hand to Turpin. And Gonzalez is a wonderful blend of flamboyance and comic relief as Pirelli (a.k.a Daniel O’Higgins). The superb chorus (listed above) deserves props as the spectacular backbone of the production, thread through each scene playing townspeople, lunatics, and other entertaining roles. Billed as “In Concert” the other solid backbone of the production is the orchestra, who remain seated on stage throughout and who interact at times with the characters. Kudos to Seth Lisle, Bass; Daniel Gonko, Drums; Ken Clifton, Conductor/Music Director; Tom McDonough, Keyboard 1; Katya Stanislavskaya, Keyboard 2: Brian Roach, Violin; Doug Lang, Reed 1; Joe Tomanelli, Reed 2; David Parsons, Trumpet; Shannon Carlson, Cello; David Hiscox, Horn; and Jim Lendvay, Trombone. Shout outs also to Tim Brown for impeccable set design; to Christina Lorraine Bullard for skillful attention to detail in her costume design; to Alan C. Edwards for flawless lighting design; Michael Vincent Skinner for marvelous sound design; to Tom Kosis as Stage Manager, to Pat McCorkle, McCorkle Casting, Ltd., and to Joshua Berman as Technical Director. Blood, bludgeoning, and other mayhem abounds in Storrs, CT and it’s not even Halloween! For a perfect summer treat, this is one not to be missed! There are certain roles that become so identified with the actor who plays them that billing changes from “as” to “is.” I remember growing up how the advertisements used to say Sean Connery “is” James Bond. 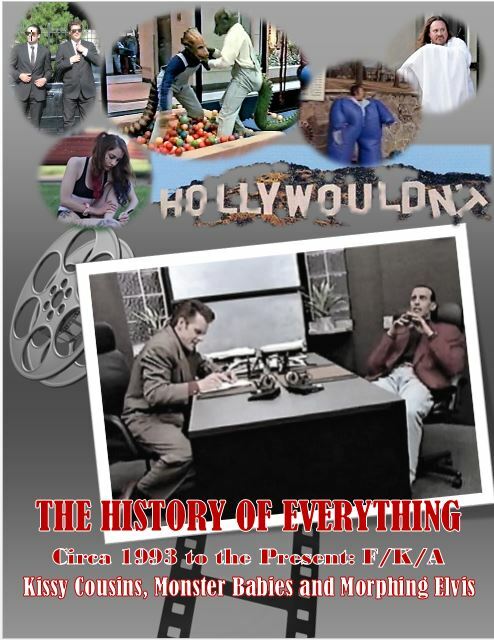 Now while this ultimate personification may be more of a marketing ploy these days than anything else, there are nevertheless vehicles in which the actors are so good that for many viewers they become the characters. 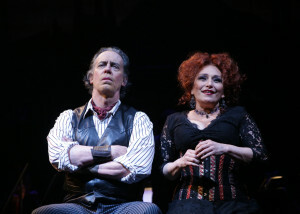 Such is true for Connecticut Repertory Theatre’s production of Sweeney Todd: The Demon Barber of Fleet Street. Terrence Mann IS Sweeney Todd and Liz Larsen IS Nellie Lovett. 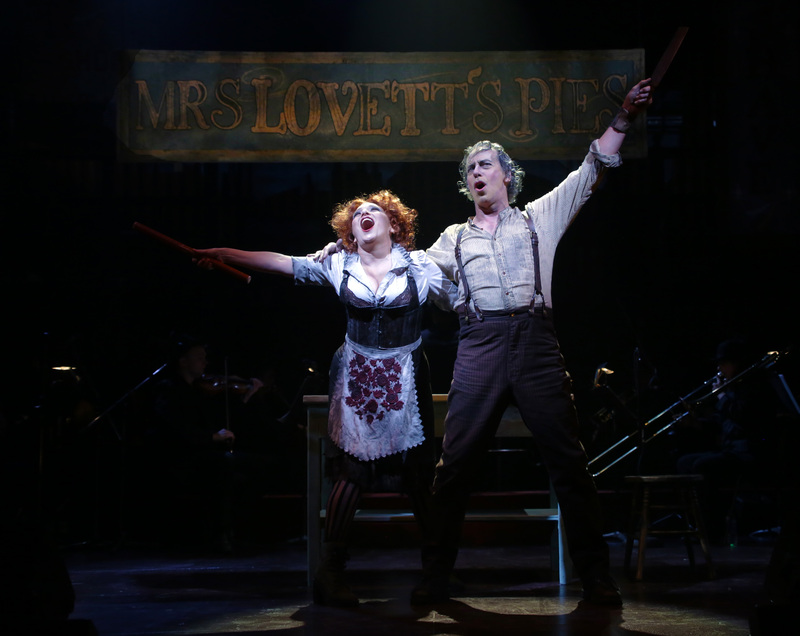 Let’s cut to the chase, or in this case the jugular – Sweeney Todd slays. It’s a wonderful tour de force (damn, I wish I was the only critic who said that about this production). Of course, the material is first class with music and lyrics by Stephen Sondheim, a killer (sorry, but the metaphors are too good to pass up) of a book by Hugh Wheeler, and orchestrations by Jonathan Tunic. Having great material is only one part of the equation. Peter Flynn did an absolute masterful job of directing and bringing this production to life. While the producers may have wanted to be conservative by calling it “A Musical Thriller in Concert,” the label is a misnomer at best. It is a full-on production with carefully designed sets, staging (even with the orchestra on stage), costumes, props and, of course, terrific singing and acting. Terrence Mann has a commanding stage presence and is absolutely bloody perfect as the revenge-seeking maestro of death. Yet, we do see a method to his madness and feel his pain and remorse at the end of the second act. His character did not start out life as a razor-wielding psychopath. Mann gives a nuanced, layered performance. And he can still belt out a song and hang notes in the air like hang gliders with the best of them. The same can be said of his co-star, Liz Larsen, as Nellie Lovett. Ms. Larsen brings just the right mix of dastardly villainy to the role ala Cruella DeVille with the comedic timing and sensibility of a Lucille Ball at times. Theatre icon Ed Dixon plays the despicable Judge Turpin to a fault. You know when an actor is succeeding as a villain when the mere sight of him or her on stage causes visceral reactions. A special shout out also must go to Andréa Burns, who played the Beggar Woman. The rest of the supporting cast are sharp as the Ripper’s blade (really sorry for that one) including Hugh Entrekin (Anthony Hope); Emile Kouatchou (Johanna Barker); Kenneth Galm (Tobias Ragg) and Lu DeJesus as the dastardly Judge Turpin’s minion (Beadle). As an aside, once Beadle killed the bird, I couldn’t wait for his comeuppance. Nicholas Gonzalez was hysterical as the Italian barber Pirelli. A production as excellent as this one could not succeed without an amazingly talented chorus and ensemble. Fortunately, this production had multiple triple threats including Ryan Albinus, Alex Campbell, Cydney Clark, Olivia Fenton, Lauryn Hobbs, Kelly McCarty, Charlie Patterson, Gregory Rodriguez, Brandon Wolfe, and Alessandro Viviano. Despite my lifelong bloodthirstiness for horror and theatre, I never saw Sweeney Todd when it was on Broadway (although I do remember the commercials with Len Cariou in the original cast) and I narrowly avoided the screen version with Johnny Depp. In retrospect, I am glad I did, because Terrence Mann, Liz Larsen, Ed Dixon and the rest of the cast will always have created the version that I will judge all others by. If you want to have a bloody good time, catch this brilliant adaptation before it dissolves into the London fog.